Who knew we’d have to dust off Woody Guthrie’s old anti-Nazi songs. Looks like Billy Bragg and Wilco did since they recorded a rollocking version of it a few years ago. Bragg rejiggered the song as part of the Mermaid Avenue project. But I’ve written up the Guthrie version that he apparently only recorded in a radio session. In the intro I’ve spaced out the chords into bars. 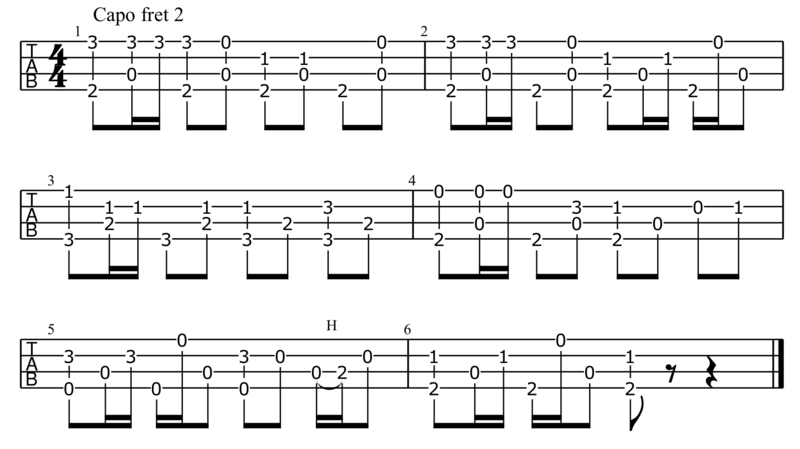 So you play the strum twice for each chord with a big gap. Then the two chords with a small gap (C and G) you play it just once. It’s the same pattern in the verses. And in the chorus it’s just twice for each chord. Here’s a little figure I cooked up for the intro using alternate picking (i.e. the thumb alternates between the g and C strings). If you’re playing the rest of the song with the capo on the second fret the chord shapes will change from G, C and D to F, Bb and C respectively.